View of the Pacific Ocean from Pacific Coast Highway. 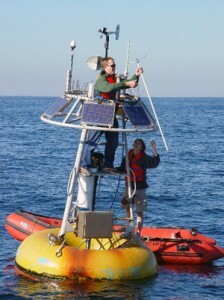 In a new five-year project, UCLA researchers will make the first detailed models predicting how climbing temperatures will affect the coastal climate in four eastern boundary upwelling systems, or EBUSes, which are off the coasts California and Oregon, Peru and Chile, southern Africa, and Spain and northern Africa. The project is supported by a $2 million grant received this month from the National Science Foundation. Current global climate models provide sketchy predictions of changes for EBUS areas, partly because the regions are such narrow slices of the globe. To overcome that flaw, the research team will develop the first fine-tuned model of the EBUSes to simulate the complex interaction between the ocean and the atmosphere, identify the difference between the natural variations in the ecosystems and variations due to climate change, and predict whether changes in cloud cover will allow in more or less sunlight and warmth. Along every seashore lies an abundance of marine life that has evolved to thrive in two different environments: underwater at high tide and above water at low tide. This unique zone is expected to be strongly influenced by rising air and sea temperatures. In fact, the distribution of intertidal species along the California coast has already shifted in response to climate change. In 1931, a marine biology student named Willis Hewatt screwed bolts onto rocks in the tide pools at Pacific Grove in Monterey Bay, set a line a hundred meters long, and counted every invertebrate creature in 105 square plots. Sixty two years later, graduate students Raphael Sagarin and Sarah Gilman resurveyed 57 of his plots and documented changes in the abundance of 46 of 62 species that were present in the 1930s. Most southern species (10 of 11) increased in abundance, while most northern species (5 of 7) decreased. During this period, shoreline ocean temperature had warmed by 0.790° C, with average summer temperatures up to 1.940° C warmer in the 13 years preceding Sagarin and Gilman’s study than in the 13 years preceding Hewatt’s. Photograph courtesy Linda Schroeder, Pacific Northwest Shell Club, Seattle, Washington PNWSC. In the 1980s, biologists discovered that the Mediterranean mussel (Mytilus gallo-provincialis) had been introduced to Southern California sometime in the last century. Originally from the Mediterranean Sea, the non-native looks so similar to the native Pacific blue mussel (Mytilus trossulus), the two mussels can only be distinguished from each other using genetic tools. Pacific blue mussels, once abundant along much of the coastline, have now been replaced by the Mediterranean mussel all the way from San Diego up to Monterey Bay. The non-native is less successful than the native mussel in colder northern waters, but survives even at warm temperatures that cause heart failure in the native species. To make matters worse, related studies show that predatory snails in Oregon and central California prefer eating the native mussel rather than the invader, most likely facilitating the spread of the invading mussel. It is expected to expand its range at the expense of the native as temperatures increase. Besides resorting to migration or just dying out, organisms have two other options. The first is to utilize an existing mechanism to acclimate to new conditions. California mussels (Mytilus californianus) have some potential to respond to rapid weather events. Their membranes can be restructured within hours in response to temperature fluctuations during the tidal cycle, but only when they’re inhabiting high intertidal sites during the summer. Identifying when organisms will have exhausted their tolerance threshold in response to ocean change could help target the most vulnerable of them for conservation. The cardiac function of the porcelain crab (Petrolisthes cinctipes), for instance, collapses at 31.5° C—very near the maximum temperature it currently experiences in nature (31° C). The survival of these intertidal crabs, which are found above water on the shore and underwater at depths of up to 90 meters from the northern Channel Islands to Alaska, could be threatened by just a slight increase in temperature. Most cells respond to acute environmental change by inducing a specific set of proteins that function to prevent and repair macromolecular damage. This reaction, termed the cellular stress response (CSR), is key in determining the range of environmental conditions which an organism can endure. Targeting genes involved in the CSR is a relatively new way to define thresholds for physiological function. For example, when mussel body temperatures reach 32° C, often attained on hot days during low tide, genes encoding proteins that repair heat damage in their bodies become active. By 36.5° C, genes are activated to clear cells of proteins that can no longer perform enzymatic activities, leading to a disruption of the organism’s biological rhythms. Researchers Andrew Y. Gracey and Kwasi Connor observed rhythmic or periodic gene expression patterns of mussels, which signified that these animals have a natural rhythm. But when the mussels were heated up to the mid-to-upper 30s C, that natural rhythm became disrupted. He and his colleague Mark Denny, a biologist at Stanford University, found that rare heat waves lead to the evolution of a high safety margin in limpets (Lottia gigantea) on the California coast—5 to 7° C above the maximum body temperature they are likely to encounter in an average year. Pointing out that most limpets are unlikely to experience such high temperatures in their lifetimes, Denny and Dowd suggested that the limpets’ generous thermal tolerance is due to the rare thermal events that wipe out the least tolerant individuals, shifting the gene pool towards greater temperature tolerance. Denny, who is studying next-generation sequencing, is also finding genetic differences between mussels on the sunny and dark side of a rock, where the difference in temperature that two individuals next to each other experience can be up to 15° C. Such genetic variation is the raw material for natural selection. Since mussels mature within a year, a new generation is born every year with the potential for rapid evolution. “When you put these things together and model how species are going to adapt or evolve in the face of climate change, depending on how much variation exists within the species, you can actually get pretty rapid evolution,” Dowd said. He hopes conservation efforts will focus on preserving enough variation so that there are some genotypes left which can tolerate extreme conditions, and added that it’s not enough to preserve around the mean but to maintain pools of genetic diversity. Perhaps, when further research leads to a more comprehensive understanding of what physiological abilities genes actually control in order to tolerate different conditions, adaption and rapid evolution can be facilitated in species with the greatest genetic variation.